Unlike many things in life, I think I have a pretty healthy attitude toward germs. I wash my hands after using the restroom, before handling my contact lenses, and when obviously dirty, but otherwise not often when I’m out and about. I attribute this routine exposure to having helped me develop antibodies to a range of germs. And it seems to be working; my immune system is strong and I’m rarely sick. 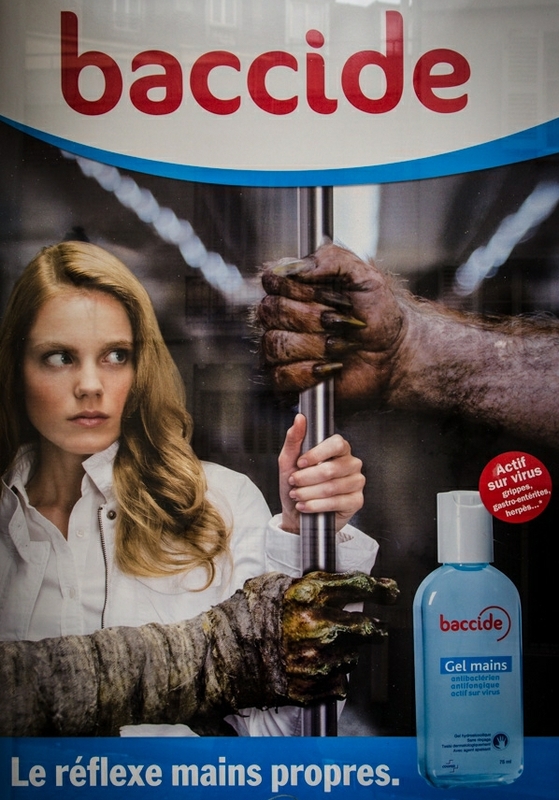 When I spotted this terrifying ad in the window of a Paris pharmacy, I instantly wanted to run to a bathroom and scrub the hell out of my hands. Especially if — as they imply — you risk catching herpes from holding the handrail on the Metro. Mon Dieu! « Join Us In San Francisco (or Online) for SF #SweetsCrawl! Same here! I’m rarely sick! But, holy cow, herpes from the metro! NOOOOOO…. there’s a lot of fear being used in that ad. who needs absinthe when you have baccide?